I love this knitwear by RCA graduate, Xiao Li whom I read about this weekend in I-D Magazine: Knitwear Extraordinaire Xiao Li. From an internet search, there are many more stunning images available, showing work from her graduation collection in 2013, some of which I include here, as well as much editorial on her future prospects. Xiao Li‘s graduate collection was all about volume and exaggerated knitwear. For her graduate collection for The Royal College Of Art, Li referenced 60s Balenciaga and architecture to create knitted forms made from two layers of textiles connected by filaments called Spacer Fabric. Using knitting samples to create moulds of patterned silicone material, the fabric was manipulated to create shapes which although large appeared lightweight. Although some pieces in the collection were mostly knitted, decorate silicone was added as hems and trims tying the hand-dyed pastel collection together. 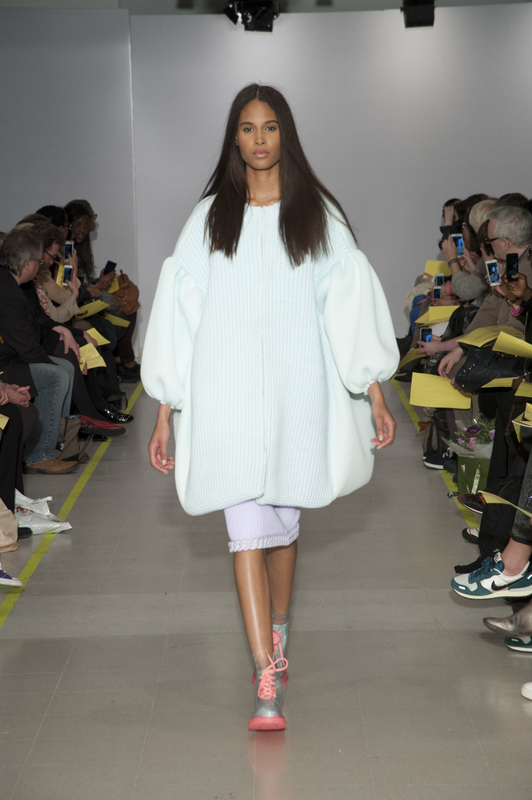 Xiao Li’s candy coloured marshmallow shapes and balloon sleeves were topped off with clear boots reminiscent of Dr Martens, completing the silicone-chic aesthetic. Li may of only just graduated, but she is definitely one to watch for the future! Dezeen is another good source to see yet more of Xiao Li’s RCA Graduate Collection. I encourage you to search and explore if you like what you see. A future star: Xiao Li.